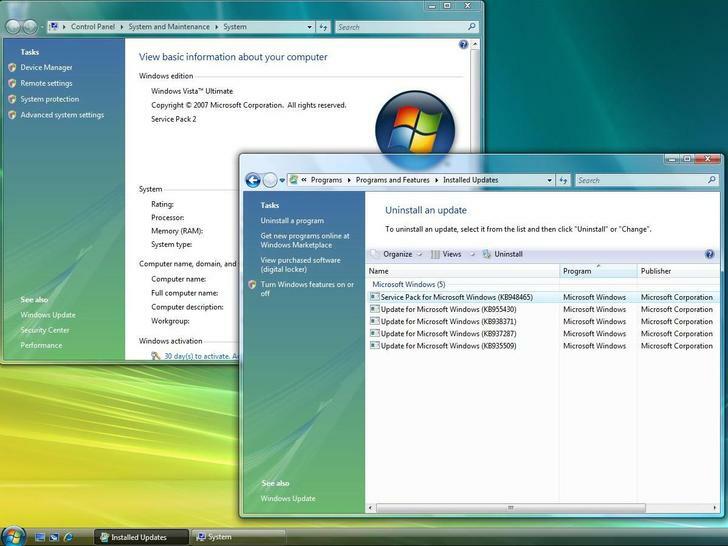 With Windows 7 due by October and looking good, and SP1 bringing Vista up to the same performance as XP SP2 (that's what Microsoft claims its Customer Experience Improvement program telemetry shows), who's going to want Vista Service Pack 2? Actually, even Microsoft says this is mainly for Windows Server 2008 (which shares much of the same code as Vista) and for putting on new PCs. Cuirrently only available to MSDN and TechNet subscribers, SP2 will be available as an optional install from Windows Update and even when it moves to be an automatic update ("after some time", as Microsoft puts it), you'll get a chance to decline it. You can download it from Windows Update and as long as you have SP1 already you'll only have to download 43MB of files (60MB for 64-bit); the full installer is anywhere from 302MB to 622MB depending on the languages and whether it's 64-bit). You'll get some of that space back; the Service Pack Clean-up tool removes files from RTM and SP1 that SP2 replaces. Expect to have to install an update and reboot first; this update installs a servicing stack that makes the SP2 installation faster and handles removing updates and optional features once it is installed. If you tried the beta of SP2, you have to uninstall it first to get the release version. Because it's the same update for Windows Server 2008 and Vista, there's been some confusion; you don't get Microsoft's Hyper-V hypervisor for Vista – it's still only for servers. You don't get Internet Explorer 8 either, but you do get Windows Search 4.0. This speeds up both indexing and search, it indexes shared folders and (if you want) encrypted files and it's more reliable (Microsoft says it fixes over 85 per cent of reported crashes), but you can download it separately. The big new feature in SP2 is burning to Blu-Ray discs; Windows DVD Maker doesn't include this yet; but you can format Blu-Ray discs and copy files to them. If you use BD-RE discs you can drag and drop files in Explorer and right-click to erase files. It also includes support for Bluetooth v2.1 and Wireless Connect Now, which have been on new Vista PCs for a while. Wireless Connect Now lets you type in a PIN to connect to a secure wireless network if your access point has a WPS (Wi-Fi Protected Setup) button, rather than typing in a long passphrase or copy the key onto a USB stick. The new Bluetooth support includes Secure Simple Pairing, which simplifies connecting a new Bluetooth peripheral, and Extended Inquiry Response, which shows friendly device names for devices. You'll get better performance on Wi-Fi connections if you leave the wireless on and the PC goes to sleep (and the network status icons in Network and Sharing Center should display correctly after hibernating). SP2 also fixes some particularly annoying bugs, including slow shutdowns and tablet users will now be able to see the on-screen keyboard properly at all DPI settings. The gadget sidebar takes less memory – about 1MB less on most systems – and Microsoft claims the RSS sidebar gadget, which has been particularly prone to crashing, is more reliable. There are other performance improvements in SP2; DirectX has better 3D performance so you should see slightly higher frame rates. If applications need their own version of a file, these side-by-side (SxS) files should now load as fast as the main version listed in the registry. Media Center performance is generally better and IE is more reliable when playing embedded videos. If you have Gigabit Ethernet, copying files to and from a network share will be faster because SP2 uses the full network bandwidth. Moving files on the same USB or FireWire drive is practically instantaneous (and Microsoft claims that you'll have fewer problems with external drives connected when you sleep or hibernate). Vista doesn't always see SD cards inside Windows Mobile phones, especially the T-Mobile Dash; that's now fixed. Not many devices use the new SDXC (eXtended Capacity) memory card specification yet but Microsoft added support for the exFAT file system it's based on in Vista SP1; SP2 adds UTC timestamps so files synchronize correctly across timezones. There aren't enough changes in SP2 to cause application compatibility issues. In fact Microsoft has worked on the Windows Filtering Platform to let more third-party security software work with Windows components. In particular Spysweeper and ZoneAlarm now work with POP3 email accounts. Power management is better in SP2; you may not see the full 10 per cent improvement Microsoft claims on all systems but one laptop we tested got nearly an extra half hour of battery life. That could be the best reason to update, but unless you're in a hurry for Blu-Ray and Bluetooth 2.1 these are welcome rather than urgent improvements.